The DORIS system (Doppler Orbitography and Radiopositioning Integrated by Satellite) was developed by CNES (Centre National d’Etudes Spatiales), IGN (Institut Géographique National) and GRGS (Groupe de Recherche en Géodésie Spatiale) to meet science and operational user requirements in very precise orbit determination and high accuracy location of ground beacons for point positioning. First of all, an overview of the overall DORIS system is performed, including the space and ground segments. Emphasis is made on the worldwide homogeneous beacon network and on the upgrade of a multi-mission ground segment to control the DORIS instruments on-board various satellites and to process the data. 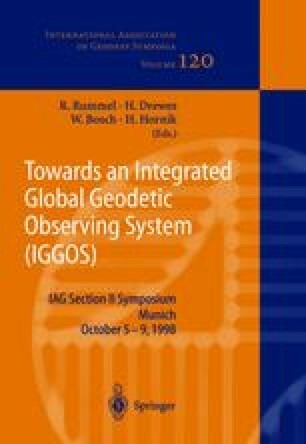 The second objective is to introduce and illustrate several important science questions dealing with the role of DORIS in a unified reference system for space oceanography. Indeed, DORIS is the kernel of most altimeter systems through orbitography (TOPEX/POSEIDON, JASON, ENVISAT). Because oceanographers have proved that very tiny signals such as the secular sea-level drift (of the order of 1.5 mm/year) may be detected thanks to altimetry, it is now clear that the future challenge will be to decorrelate the contribution of the long term variations of the reference system from the “true” ocean signal. Then, problems of stability of the reference system on a multi-year time scale, as well as problems of comparing tide gauge measurements to altimetry are discussed.